Activated charcoal, also known as activated carbon, is a form of carbon prepared to have a large surface area. Activated charcoal is used in the emergency treatment of certain kinds of poisoning or medication overdoses. It adsorbs (sticks to) substances to prevent them from being absorbed from the stomach into the bloodstream. [link] For the same reason, activated charcoal can disable important, necessary medications. Though activated charcoal can have many beneficial uses [link], in beverages it is used to turn cocktails black in color. It does not have a significant flavor impact but could have negative impacts on health of people who consume it. Alternatives to activated charcoal are mentioned below. Outside the US "vegetable carbon black" or "vegetable carbon" or "carbon black" with European food number E153 is approved for food use in the European Union [link] but not in the United States (see below) and [link]. It appears that E153 may be made from activated charcoal or regular charcoal, but this needs additional verification. The FDA says that it currently has no regulation on activated charcoal as a food additive or color additive as an ingredient to be added to food — though companies may decide that their use of activated charcoal is “generally recognized as safe” after approval from “qualified experts,” which allows legal usage before official FDA approval. In a non-binding FDA memo related to using charcoal as a coloring additive for salt in 2015 [link], the FDA declared that charcoal is not an approved food coloring. Furthermore, neither charcoal nor red clay is listed in FDA’s regulations for use in coloring food, including sea salt (see section 721(b) of the FD&C Act (21 U.S.C. 379e(b)). Therefore, any food that contains these color additives is adulterated under section 402(c) of the FD&C Act (21 U.S.C. 342(c)). The introduction or delivery for introduction into interstate commerce of any food that is adulterated is a prohibited act. FDA can take enforcement action against an adulterated food product, consistent with our priorities and resources. Activated charcoal may have the side effect of disabling necessary medications, while its only purpose in a drink is only as a colorant to make drinks black. Alternative colorants are listed below. The impacts that activated charcoal in cocktails may have on medication depends on the type of medication, timing of taking medication, and how much activated charcoal is in the beverage. While some sources say that one shouldn't consume activated charcoal within an hour of taking medication [link], in the Activated Charcoal Primer linked above, Dr. Copen reaches the conclusion*, "In my opinion, for the vast majority of basically healthy people, an interval of about 8 to 10 hours should be enough to ensure that there’s no significant medication adsorption, no matter what your guest ate or will eat." * This article reflects the opinions of the author and does not constitute medical advice. CocktailSafe provides information about cocktail ingredients and techniques to promote making safer drinks. This site is for reference only. Learn more here. 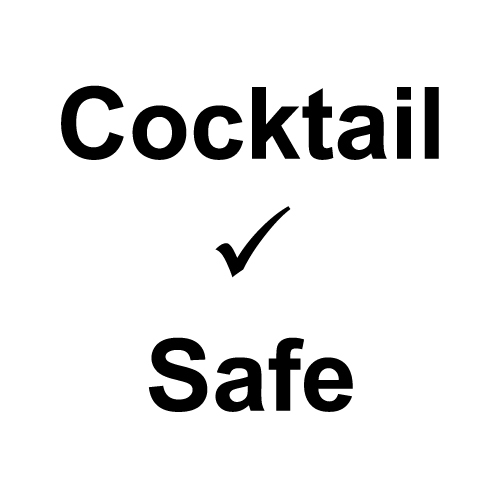 Subscribe to CocktailSafe posts or the Alcademics newsletter. CocktailSafe is supported by a grant from the Tales of the Cocktail Foundation. Learn how individuals, bars, and brands can help support the mission of CocktailSafe by spreading the word or partnering with us.